A magazine is an ammunition storage and feeding device within or attached to a repeating firearm. 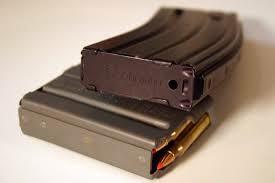 Magazines can be removable (detachable) or integral to the firearm. The magazine functions by moving the cartridges stored in the magazine into a position where they may be loaded into the chamber by the action of the firearm. The detachable magazine is often referred to as a clip, although this is technically inaccurate. Magazines come in many shapes and sizes, from those of bolt-action express rifles that hold only a few rounds to drum magazines for self-loading rifles that can hold one hundred rounds or more. Various jurisdictions ban what they define as "high-capacity magazines".